"He was so upbeat, in spite of the heat. His songs are great and he really gets the children involved"
"I have used singing in my summer reading programs for many years. I appreciate Randy writing catchy, easy to learn songs of substance on the theme. It sets a positive, happy tone." Interaction and involvment of all the "Audience"
I like that most of his songs offered opportunity for movement. I liked the sign language song and Rusty the Robot, and encouraging children to be friendly and not bully. "Jammin Randy is the Best! We will ALWAYS make a point to schedule him every year here at our Library!" "Grown-ups were very impressed with the show and the kids loved it." "I liked that the kids were a part of the show, wonderful interaction, with alot of movement." "Everything was very age appropriate and we even had Preschool children rocking out with Randy." Fun new original songs about the planets, stars, and the sun! There will be stories about space and of course some Jammin'!!! Rockin' Rocketship Rocking Through the Universe! will be dancing, singing and moving to Randy's Award Winning original songs! Taste of Omaha Festival and many other fairs and festivals. 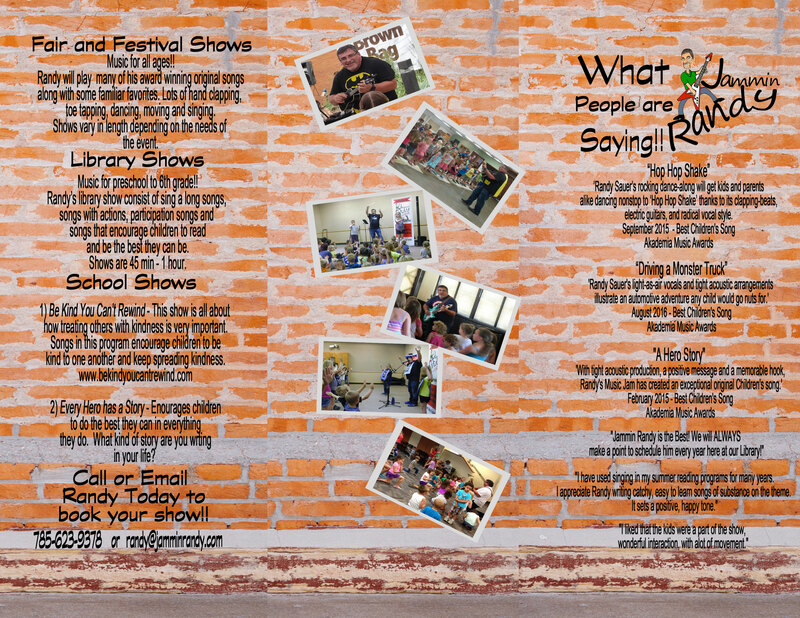 "Jammin' Randy's library show is a fun and interactive show children and adults can enjoy!" 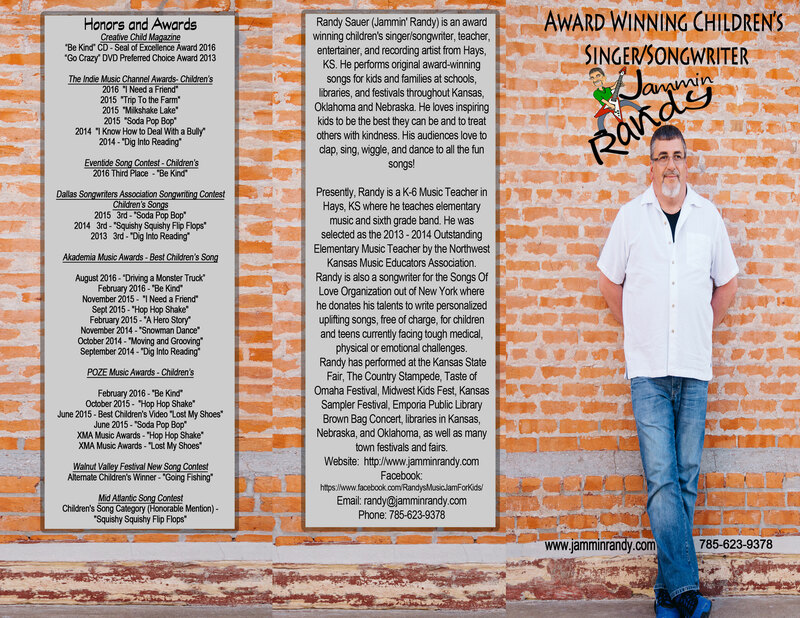 "Randy's shows are well-paced and always promote the summer reading theme. The kids love to have him come!" "Jammin' Randy is the greatest show for children, and adults love it too! He comes highly recommended by the Norton Public Library! We plan to have him several times next year! Our kids love him!!" "Randy is so easy to work with. The kids love his music, and the actions. He puts on a quality show and gives us our money's worth. We'll have him again." Randy's show involves the entire crowd, adults and children alike. The sound system he provides works in large or small settings. It is a definite added value. Randy can read the crowd and know what songs will work and how long to keep them going. And he stays so involved with the crowd. Even the librarians get into the action. or use the form to the right to contact Jammin' Randy!! Click on button to download brochure.